Let Freedom Model's help you or your loved one in our alternative to inpatient alcohol rehabilitation center. Call those programs that interest you to see if they are currently accepting clients. When on the phone with the program, ask about the success rate and how they get the numbers, there is a growing trend among alcohol rehab centers making up there own statistics. Be vigilant in your search for truth and beware of self defeating programs (i.e. 12 step programs). 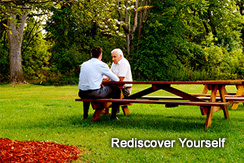 Talk to people who may have visited the alcohol rehab center you plan on attending. Visit the Web site of the chosen inpatient alcohol rehabilitation center, look for inconsistencies in there philosophy (i.e. "this is not a religious program then pumping religion as the solution). Beware programs that state "this is the only way to get sober" because this is never the case. Look for an alcohol rehab center that uses a program that instills confidence not fear, which looks to the future not one day at a time, that frees you from a victim mentality not traps you as a hopeless doomed person. Visit the inpatient alcohol rehabilitation center, see if it is a lock down type facility as you are not a prisoner you are an adult and should be treated as such. Avoid programs that endorse life long support groups as they are demeaning and counterproductive and foster a victim mentality. Lastly, in you search for an effective alcohol rehab program, look out for Bait and Switch: First, they will tell you that you can do it your way. Then they tell you that you must do it their way. Likewise, first they will tell you that you have a free choice in how to work the program, and then they tell you that you have no choice, and must do it their way, or else your fate will be "Jails, Institutions, or Death". Same as above, first, they will tell you that you can "Take what you want, and leave the rest", but soon that will morph into: "You aren't qualified to judge what you should take - your brain is messed up from alcohol, "Your Best Thinking Got You Here", and it's too early in your recovery for you to start being creative - so you should just do what your sponsor says, and Keep Coming Back!"